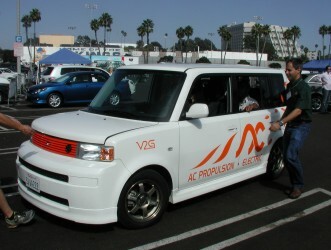 The eBox is a new electric car from AC Propulsion. We designed it to meet the needs of urban and suburban drivers who want smooth, quiet, powerful, efficient, clean, convenient, and fun-to-drive transportation. The eBox will satisfy those drivers because it is powered by AC Propulsion’s patented drive system technology that delivers an unprecedented combination of both power, at freeway speeds, and efficiency, when the going gets slow. The eBox’s unique lithium ion battery, made from 5,088 small cells, stores more energy with less weight than other EV batteries so the eBox is light, responsive, and well-balanced even though the interior offers space for five comfortable people or for the many other items that people need to move around town. Well-built and fully-equipped, the eBox creates a serenity for its passengers, a serenity borne of the many virtues of electric transportation. At AC Propulsion, we can’t take credit for those virtues, but we can take credit for putting them on the road in the eBox. We are proud of the eBox. Since our founding in 1992, it is the best EV we’ve built.